Cats can vomit for a lot of different reasons, some of which are serious and some are not. So what exactly causes a cat to vomit? Just like humans, cats can overeat or have an upset stomach from eating the wrong thing, which results in the cat vomiting. However, a cat who throws up may have something more serious going on. What are some common causes for a cat to throw up and when should you be concerned? When your cat shows signs of sudden or acute vomiting, the episode may just pass on its own. However, if your cat suffers from routine vomiting, then seek your veterinarian’s advice. Recurring vomiting episodes could be a sign of a serious problem. If your cat has diarrhea along with vomiting, there may be other problems. If your cat is dehydrated or has little energy, something more serious could be going on. If there is blood in the vomit or your cat is losing significant weight, something more serious than an upset tummy is likely happening. 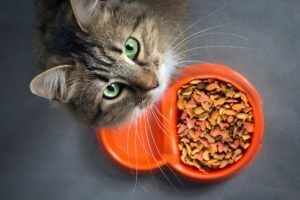 If your cat isn’t eating and drinking like normal, then it’s quite possible there’s a more serious issue. Although you might be able to help your cat overcome periodic vomiting due to minor stomach issues, if your cat is experiencing any of the above symptoms, then you might want seek the help of your veterinarian. An experienced veterinarian will be able to determine the best course of action in order to diagnose and then treat whatever ails your fluffy friend. By reviewing your cat’s medical history and performing a thorough examination, a veterinarian can choose the most appropriate tests to perform to get to the root of the problem. After your veterinarian has diagnosed what ails your pet, treatment options deemed best for your cat will be prescribed. Many times, you can care for your cat at home, just like you would a sick child. Other times your cat might need more intensive medical care, including medication. 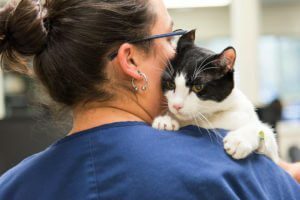 In any case, a trusted veterinarian can help you determine what exactly your cat needs to get him or her feeling well again.